When Princess Hang Li Poh was married to Malaccan Sultan Mansur Shah in the mid-15th century, an amalgamation in culture began to happen as Chinese men married local women. 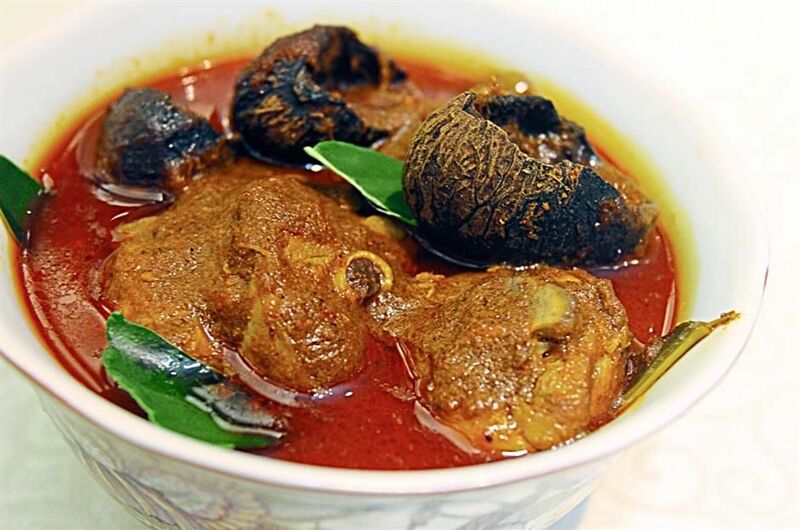 This resulted in Peranakan cuisine along the years, or what we call Nyonya food, which is a blend between different cultures, mainly Malay and Chinese. In a little town like Malacca, visitors are bound to find the best Nyonya food around, appealing to the eye and delightful to the tongue. 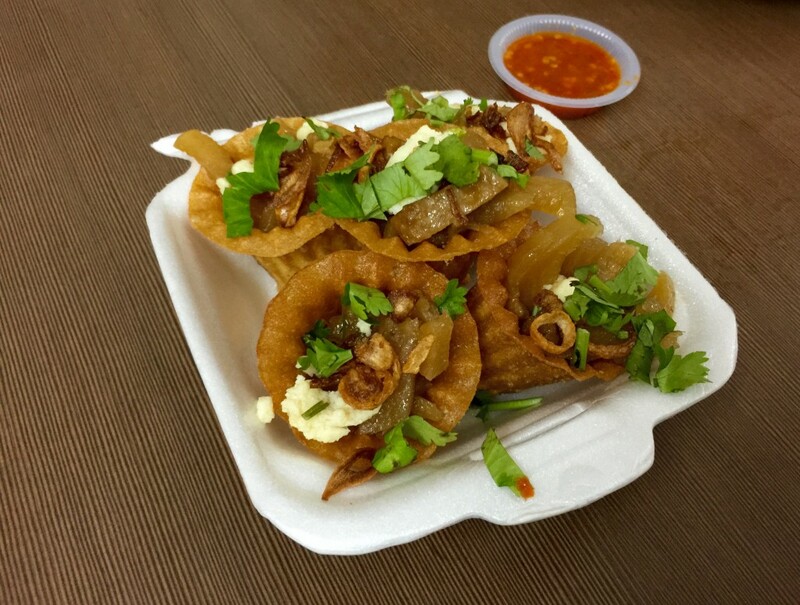 We’ll be sharing a list of the best Nyonya food in Malacca, hence keep your eyes open for these interesting flavours! 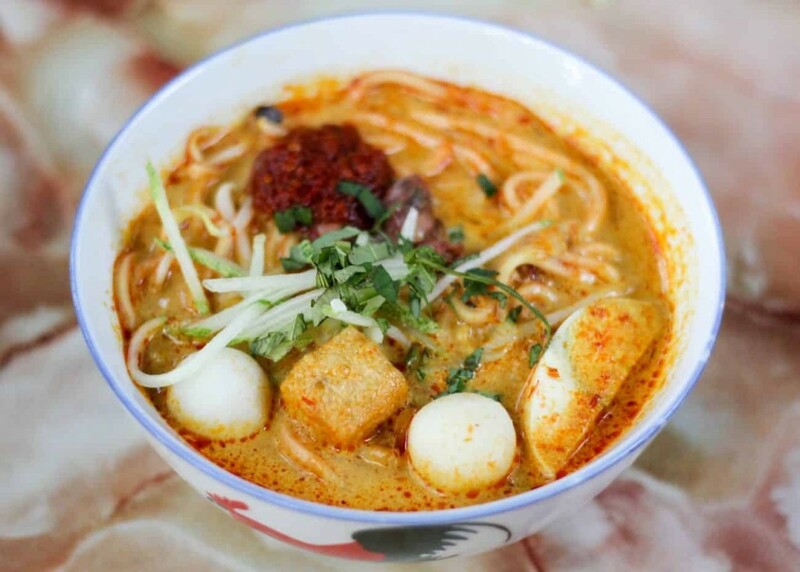 Nyonya Laksa, also known as Curry Laksa, is one of the Laksa variations that you can find in Malaysia. A bowl of creamy, curry broth, filled with rice vermicelli, egg, fish balls, Tau Pok (tofu puffs), and garnished with cucumber strips and spring onions – is what you’ll get at Baba Low 486 in Malacca. The spiciness of this dish is mild, but if you’re up for the challenge, simply mix in the scoop of fresh Sambal that’s placed on top of the broth. Situated in a more remote area on Jalan Tengkera in Malacca, it’s frequently visited by locals and it’s the talk of the town among non-locals. Address: 486, Jalan Tengkera, 75200 Melaka. The Pong Teh Babi at Unicorn Café has been one that’s been talked about recently. Using pork belly and trotters or pork shoulders as its main ingredient, this dish is a balance between salty and sweet in a bowl of shiny, brown gravy. With meat that’s cooked to perfect tenderness and gravy that’s neither too salty nor too sweet, Unicorn Café gives first-timers a great experience of Nyonya food. Upon eating the Pong Teh Babi, patrons can taste fermented soybean paste, which is the major ingredient for its gravy. 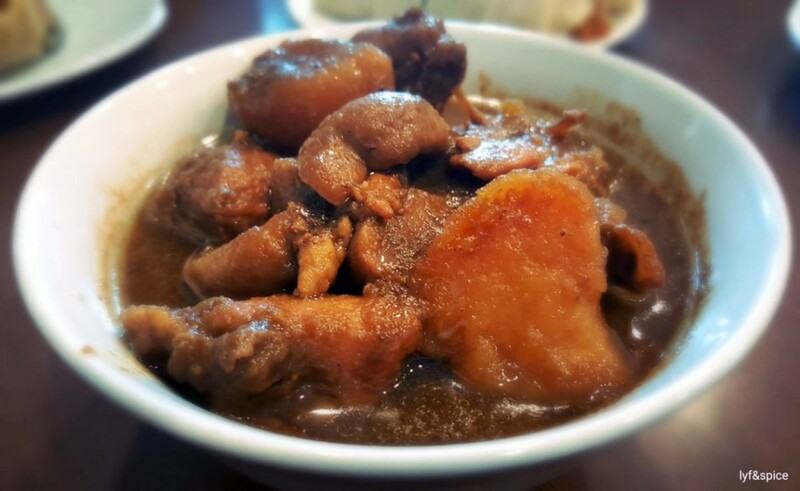 Served with white rice, the Pong Teh Babi is an excellent dish for a hearty Nyonya meal. Address: 626, Jalan Melaka Raya 10, Malacca. Shaped like a top hat, Pie Tee is also called Top Hat in Malacca. Nancy’s Kitchen offers very simple but well-done Pie Tees. A thin, crispy cone fried to golden-brown perfection, it resembles an upside down top hat with fillings that stack up and exceed its height. Stuffed with mainly sliced jicama, the Pie Tee’s flavours are further enhanced with sliced cucumbers and omelette bits. The things that make this stack go even higher are the shallots, coriander leaves, and finally a few drops of homemade chilli sauce. The first bite is the most crucial, where your teeth meets the crunchiness of the cone, and your tongue, the natural sweetness of the juicy jicama. Now that’s a burst of flavours. Address: 13, Jalan KL 3/1b, Taman Kota Laksamana, 75200 Melaka. For this dish, the spotlight shall be placed on the Buah Keluak (fruit of the pangium edule), for this dish wouldn’t have existed without it. As it takes more effort for the preparation of this dish, not many people or businesses would include this sweet, sour and spicy dish in their menu. The Buah Keluak is similar to a nut, with a shell that needs to be cracked open, but its taste is one and only. It has been described as having an earthy taste and is comparable to truffles. The black and oily flesh of the fruit gives a kind of flavour to the Ayam Buah Keluak which would otherwise be mundane. However, you’ll definitely need to give it a try at Amy’s Heritage Restaurant in order to understand its extraordinary taste. Address: 75, Jalan Melaka Raya 26, Taman Melaka Raya, 75000 Malacca. 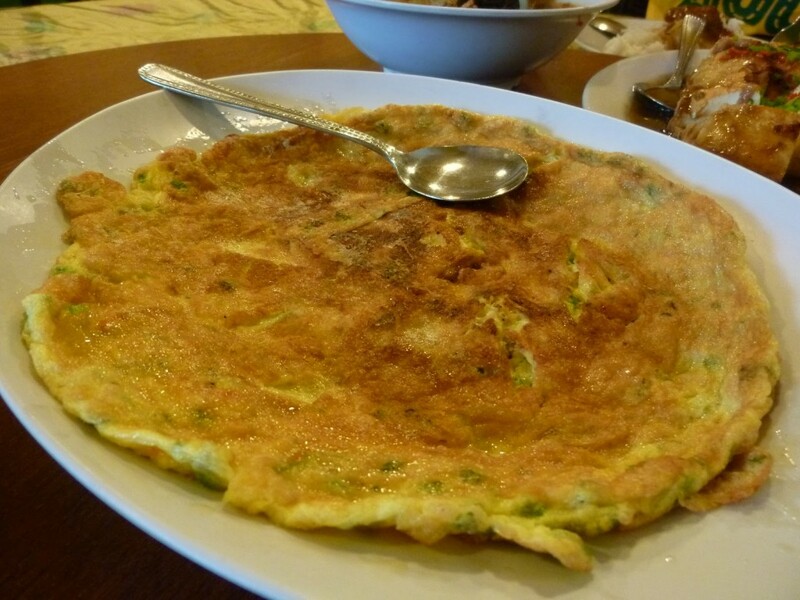 It’s a simple omelette, but what makes it special is the Cincalok (fermented tiny shrimps). The Cincalok is marinated with salt, sugar and water, and it usually comes in a bottle. To many, the fishy, pungent smell can be uninviting, but it tastes good once it is cooked with a variety of dishes. In this case, it’s with eggs. When cooking Cincalok omelette, you don’t have to add any seasoning because the fermented shrimps will produce all the flavours you need. The Cincalok provides a salty and pungent taste to the omelette, turning a simple dish into something distinctively Nyonya. Address: Jalan Merdeka, Taman Costa Mahkota, 75000 Melaka. Fried fish is a homemade dish that’s common among different households, be it Malay, Chinese, Indian or any other Malaysian ethnicities. However, Ikan Goreng Cili Garam, which means fried fish with chilli and salt, adds a little twist to this otherwise original dish. Fishes like croakers, mackerels and pomfrets are frequently used to prepare the Ikan Goreng Cili Garam. The fish is deep-fried until the outside becomes crispy, then topped with a blend of fresh chillies and salt. The mixture of chillies, when eaten together with the fresh fish, is a great combination that explains why this dish is a favourite among the Peranakan community. Aunty Lee’s Restaurant at Taman Sinn is one of the Nyonya restaurants in Malacca that serves a delicious version of the traditional Ikan Goreng Cili Garam. Address: 385, Jalan Ujong Pasir, Taman Sinn, 75050 Melaka. With a texture that’s similar to creamy soup, the Udang Lemak Nenas is a prawn-based dish that is bound to give its tasters a great deal of satisfaction. 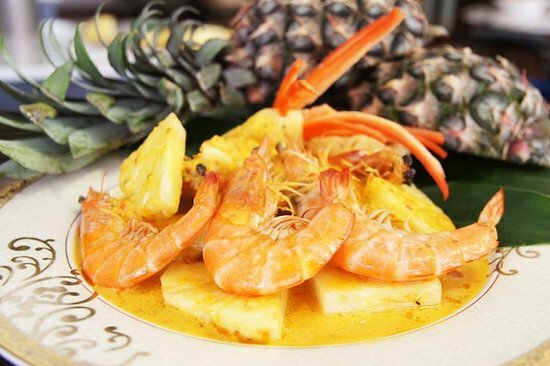 With a rich flavour that comes from the coconut milk, curry and pineapple, the yellow gravy becomes a crucial complement to the fresh and succulent prawns. Hints of spiciness and sourness also enhance this tasty dish, making it even better than it already is. Nyonya Suan prepares this dish pretty well, which explains why it’s on the chef’s recommendation list. 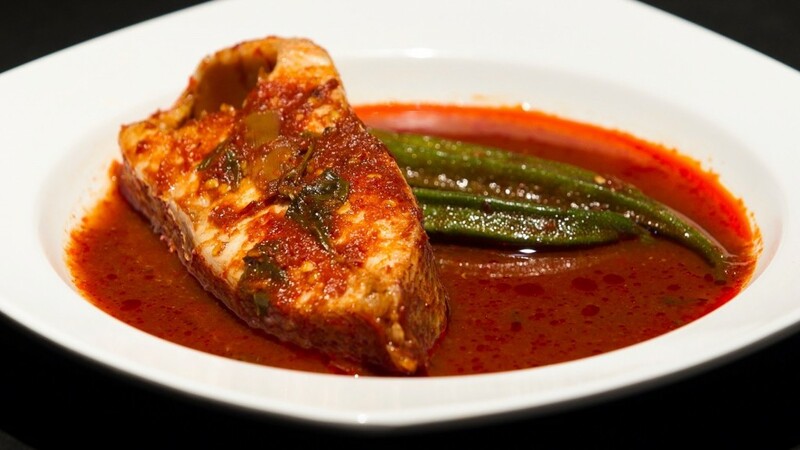 Ikan Asam Pedas, also known as Assam Fish, is a sour and spicy dish that is meant to tease your taste buds and stimulate your sense of taste. 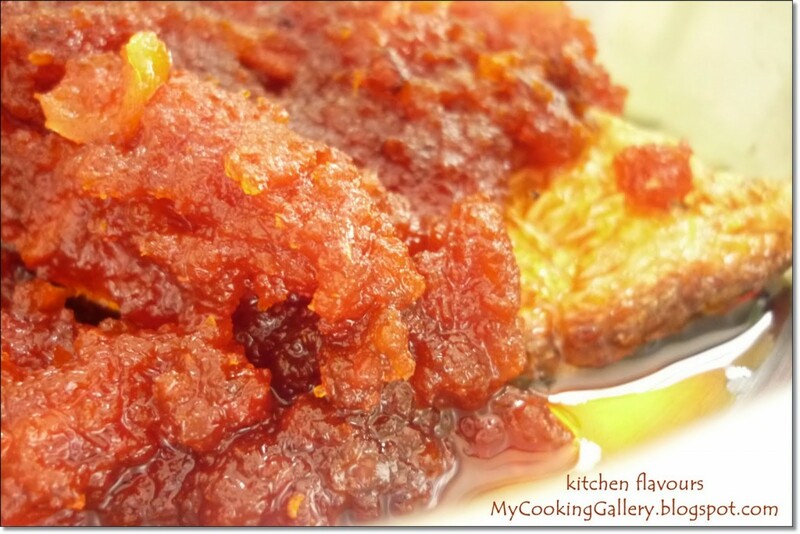 A few important ingredients that are present in the sauce of this dish are the Belacan (dried shrimp paste), tamarind, dried chillies, lemongrass and turmeric. With sourness and spiciness dominating its taste, the tamarind and chilli are must-haves for the Ikan Asam Pedas. The sauce is soupy instead of thick, which is great when eaten with white rice. The first spoon of its sauce at Cottage Spices Restaurant is guaranteed to make your face scrunch, but love it or hate it, it’s still a good Nyonya dish that’s favoured by many people. Address: 171, Jalan Merdeka, Taman Melaka Raya, 75000 Melaka. For dessert: a big ball of thinly-shaved ice, coated in creamy coconut milk, drizzled with sweet syrup made of palm sugar (Gula Melaka), piled on top of red beans and green noodle-like jelly, on a hot summer day. 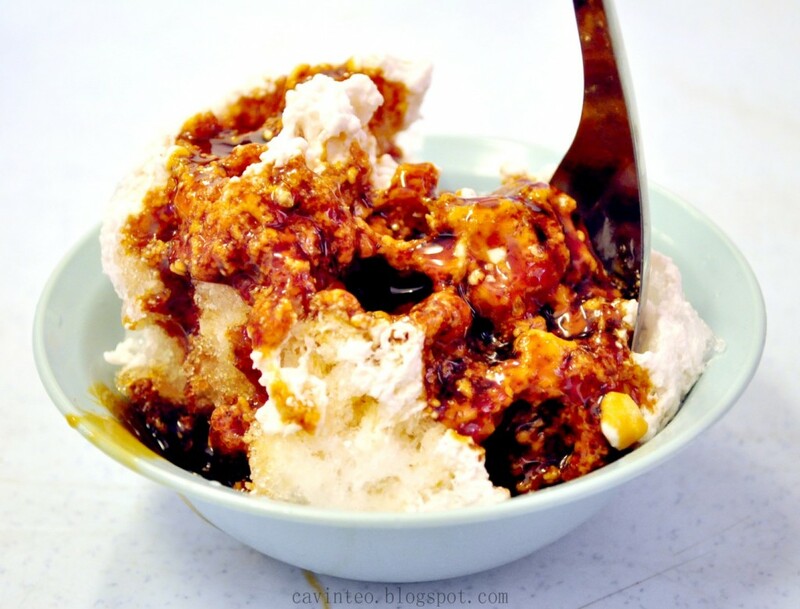 A popular dessert and a must-eat in Malacca, Cendol definitely cures a person’s cravings for something sweet and cold. One of the best Cendol in Malacca town is Jonker 88 on Jalan Hang Jebat. Jonker 88 serves a generous amount of coconut milk on their Cendol until it forms a beautiful, smooth, white coating. Slicing through the coat with a spoon, the Gula Melaka layer flows into the slit, and that’s when you should take bite, or mix it altogether for an even blend. Address: 88, Jalan Hang Jebat, 75200 Melaka. If you have a sweet tooth, do not miss out the Nyonya Kuih at Baba Charlie’s shop! 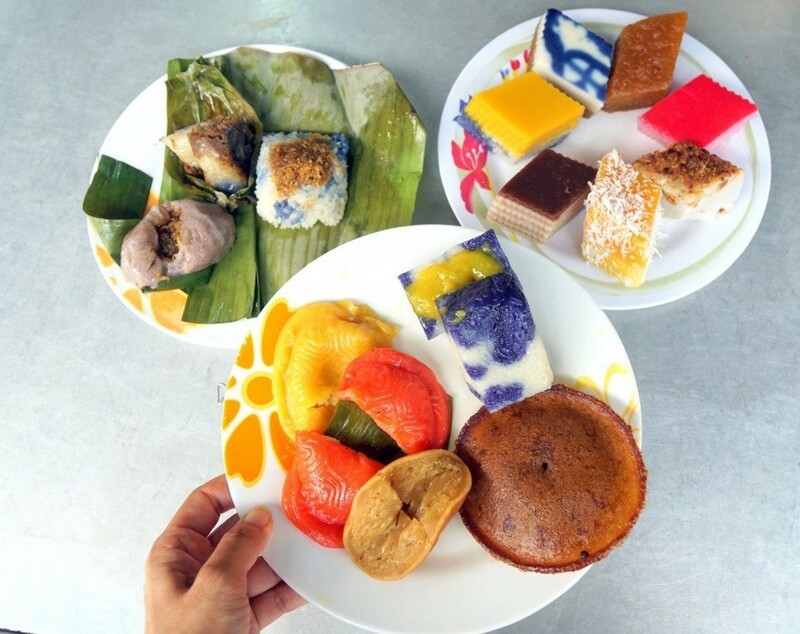 An array of Nyonya Kuih is placed in one section of the house, presenting so many colours all at once, a truly appetising sight for visitors. Among them are the Onde-onde, Kuih Lapis, Kuih Talam, Apam Balik Kelapa, Pulut Tekan, Kuih Dadar etc., with more than 20 types of Kuih for you to choose. One of the favourites, Onde-onde, has an outer skin made of glutinous rice flour, tapioca flour and Pandan leaf extract, with palm sugar in the middle. When you bite into it, the melted palm sugar syrup pops out from within, allowing you to taste a burst of sweetness and fragrance at the same time. Address: 72, Lorong Tengkera Pantai 2c, Kampung Tengkera Pantai Dua, 75200 Melaka. Follow this list on your journey in the little town of Malacca, and discover all the best Nyonya food in Malacca one by one. It gives you a taste of culture, and a depth in flavour.